A template is a copy you make of one or several layers, or of one or several panels, into a library. Once you have created a template, you can re-import it as many times as you need, either in the same project or in a different project. 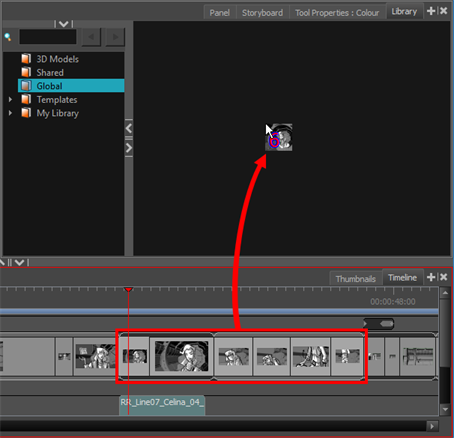 You can create a template of one or several layers from the Layer panel in the Stage or Camera view. 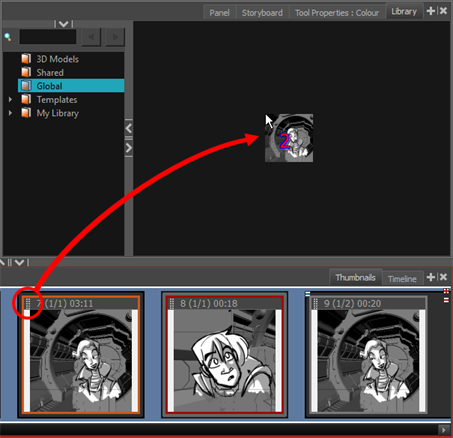 You can import a layer template into a panel using the Stage or Camera view. 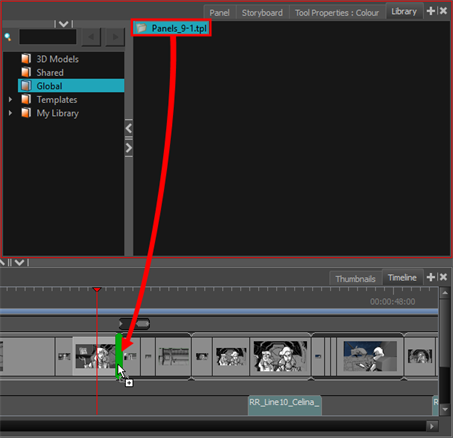 In the Thumbnails or Timeline view, select the panel in which you want to insert the template. 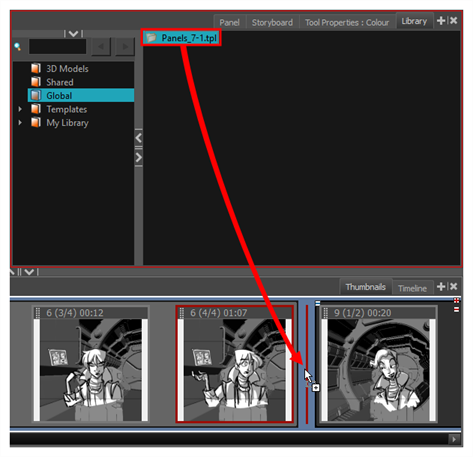 If you want to insert it over all the other layers, you can drop it directly into the Stage or Camera view. You can also drag and drop a template over the thumbnail of any panel in the Thumbnails or Timeline view. When you do this, the template's layers are added to that panel. You can also import a template made of a single panel into the Stage or Camera view. When you do this, all of the template's layers are added to the current panel. However, you cannot import a template made of multiple panels into the Stage or Camera view. You can create a template of one or several panels using the Thumbnails or Timeline view. You can import a panel template into the Thumbnails or Timeline view. Drag and drop the selected template into the Thumbnails view, between the two panels where you want it to be inserted. If you are inserting the template between two scenes, you are able to choose whether the panel will beattached to the previous scene or the next scene, or whether it will be inserted into its own scene. This will depend on how close to either scene or to the gap between them you drop the template. As you move the panel around in the gap, a red line will indicate where the panel will end up. Drag the selected template into the Timeline view, between the two panels where you want it to be inserted. 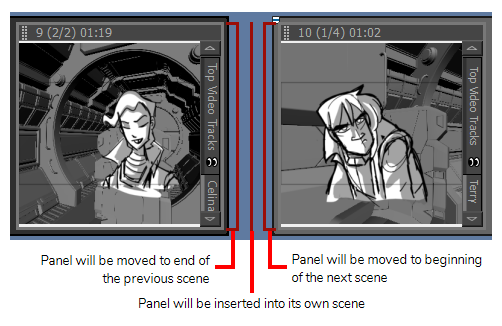 If you are inserting the template between two scenes, you are able to choose whether the panel will be attached to the previous scene or the next scene, or whether it will be inserted into its own scene. This will depend on how close to either scene you drop the template. As you move the panel around the seam between the scenes, a green bracket will indicate where the panel will end up.